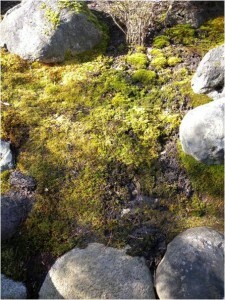 Anthocerotophyta is the least diverse phylum of the bryophytes, however its distribution is widespread, with Antarctica being the only continent in which they are not found. Most species in this phylum typically grow on moist soil in shaded areas, but some are found growing in exposed sites, while a few others are epiphytic. Hornworts are considered to be ecological pioneers as they often grow in areas where there is little to no competition, such as on mineral soils. Although they may superficially resemble a thalloid liverwort, they have gametophytic and sporophytic features that separates them from other bryophytes seen thus far. All species have a thalloid gametophyte that is flattened and can occur in the form of a rosette or ribbon. In most genera, the thallus is multistratose in the center and thins out closer to the margins. 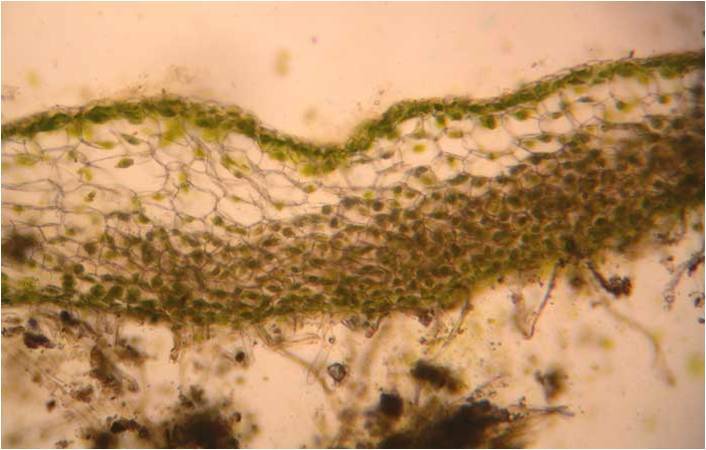 The cells on the upper surface of the thallus are generally chlorophyllose, while those found in deeper layers do not contain chloroplasts. Most genera of this phylum have a single large chloroplast per photosynthetic as well as a pyrenoid associated with the plastid. Hornworts cluster Rubisco in the pyrenoid, which is a trait that is also seen in algae. These features along with the absence of oil bodies aid in distinguishing these species with those in Marchantiophyta. The surface of the thallus is generally cutinized, however this cuticle layer does not prevent gas exchange from occurring. The thalli are attached to the substrata by smooth, thin-walled, unbranched and unicellular rhizoids. While the thallus is primarily composed of parenchyma cells and has little tissue differentiation, there are often intercellular cavities, which are filled with mucilage, on the ventral surface. 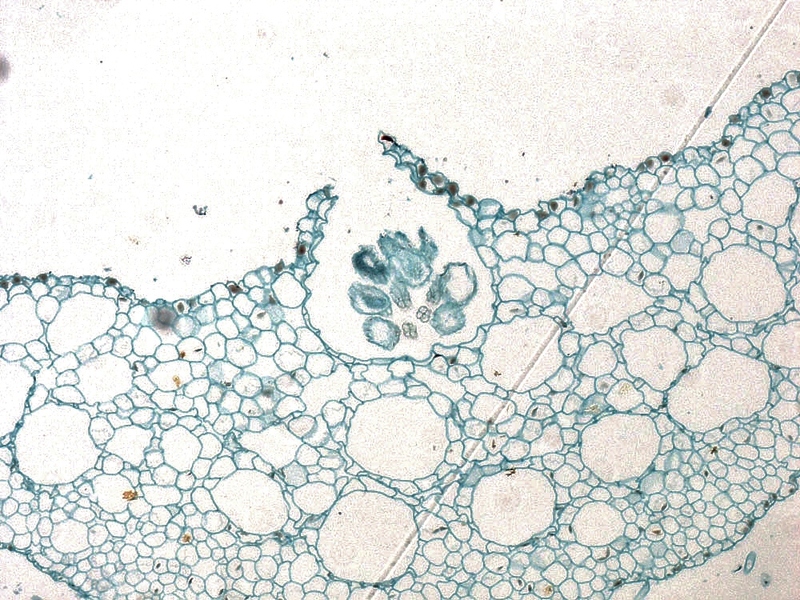 These mucilage chambers, as seen in this picture, open to the environment due to the presence of stomata-like pores and are frequently invaded by small colonies of blue-green algae called Nostoc. Nostoc are filamentous cyanobacteria that can easily fix nitrogen. They are able to form symbiotic relationships with hornworts in which the alga receives carbohydrates and a protected shelter while the hornwort receives the fixed nitrogen. Most species within this phylum are bisexual, having both the male and female sexual organ embedded in the upper surface of the thallus. The antheridia, which develop in chambers within the thallus, are derived from a single initial. 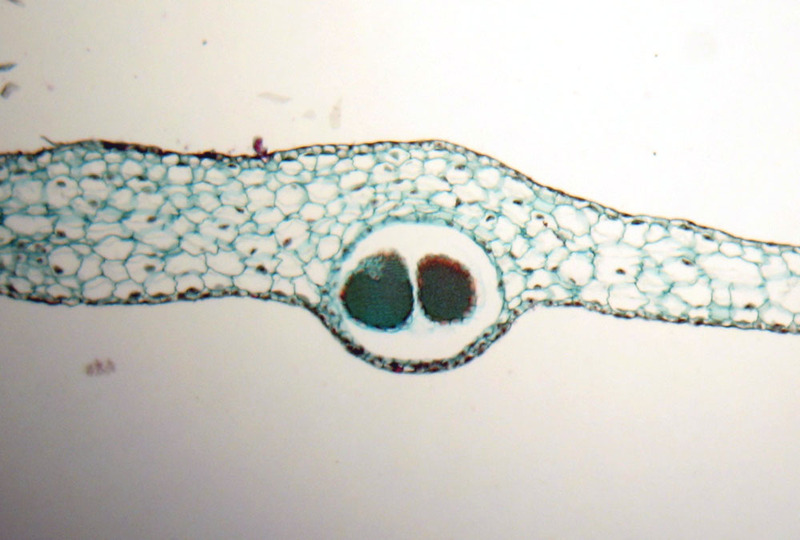 Furthermore, this initial is capable of giving rise to several antheridia within the same chamber, as seen in this picture. The archegonia, which are also embedded within the thallus, are derived from an initial cell. While only the upper portion of the neck rises from the surface of the thallus, the lower portion of the neck as well as the egg cell remain beneath the surface. Because the cells that surround the archegonia do not differ from those of the thallus, the sexual organ is not considered discrete. The Anthocerotophyta are characterized by their long, horn-shaped sporophyte, from which they get their name “hornworts”. 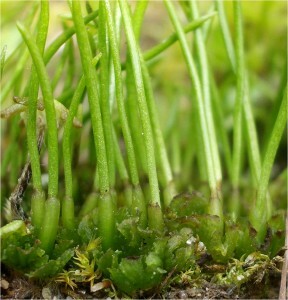 Although the sporophyte remains attached to its parent, like in other bryophytes, it differs significantly in that it possesses an meristematic region at its base. 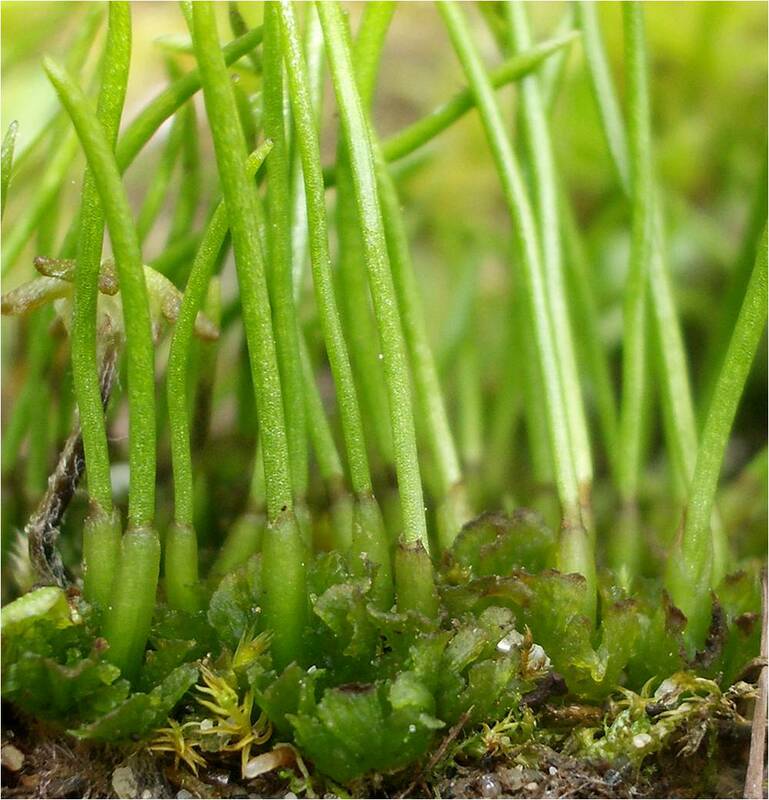 This feature allows the sporophyte to have indeterminate growth, giving it the ability to differentiate new sporogenous tissues throughout its life. 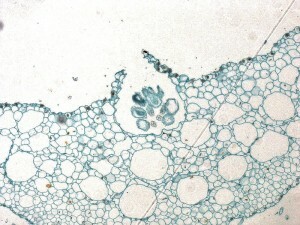 Stomata similar to those found in vascular plants can be found on the sporangium, however, unlike those in higher plants, they do not open or close. As the sporophyte grows, it not only becomes longer but the spores at different height within the sporangium differ in maturity. 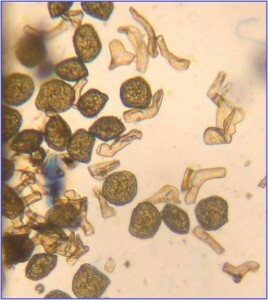 The younger spores at the base of the sporangium typically remain in a tetrahedral arrangement, while the mature spores near the tip are separated. The sporophyte lacks a seta but has a columella, and dehiscence occurs along one or two longitudinal lines, thus the spores are released along the halves as they mature. Not only are there spores within the sporangium, but there is also the presence of pseudo-elaters. These multicellular structures are filamentous and aid in the dispersal of the spores by changing their shape when dry. Their cells walls can either be thin, spirally thickened or even. 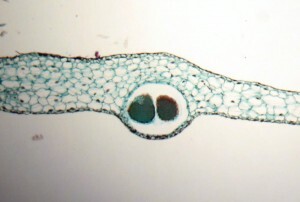 Although they resemble the elaters seen in the liverworts, the difference in the cell division patterns sets them apart. Although asexual reproduction is rare in hornworts, a few species produce marginal gemmae while others are capable of producing perennating tubers, which are able to tolerate some dessication. A simple and effective means of asexual reproduction is by having the older parts of the thallus die off, leaving the younger and disconnected parts to continue to grow.